A basic model class for forms. This implements field data and validation handling for (simple) form-based views. It provides a standard way for views to perform field validation, and react to validation results. All fields are uniquely identified using a string literal (which is the Field type). For each field, its value, the visibility, whether the field is read-only, and its current validation status is managed by the model. In addition, you will typically specialize the class to customize the validation and application logic. The Field type is 'const char *, and instead of string comparisons to identify fields, pointer comparisons are used. Thus you really should use the same field constant throughout your code to refer to a given field, and you cannot use C++11 constexpr for the field constant since that does not have a unique value (since it has no storage). Although it can be setup to use WValidator objects for individual fields, also other validation where more entered information needs to be considered simultaneously can be implemented. A model is typically used by a View which renders the fields configured in the model, updates the model values, invokes and reflects the validation status. A type to identify a field. Fields are identified by a string literal constant. Instead of string comparisons to identify fields, pointer comparisons are used. Thus you really should use the same field constant throughout your code to refer to a given field, and you cannot use C++11 constexpr for the field constant since that does not have a unique value (since it has no storage). Creates a new form model. The field is added to the model, with an optional short informational message that can be used by views to provide a hint on the value that needs to be entered. The message is set as the validation message as long as the field has not yet been validated. If the field was already in the model, its data is reset. This returns the fields currently configured in the model (added with addField() or for which a value or property has been set). Returns whether a field is read only. Returns whether the field has been validated yet. This is initially false, and set to true by setValidation(). Returns whether a field is visible. In some cases not all fields of the model need to be shown. This may depend on values input for certain fields, and thus change dynamically. You may specialize this method to indicate that a certain field should be invisible. The default implementation returns the value set by setVisible(). 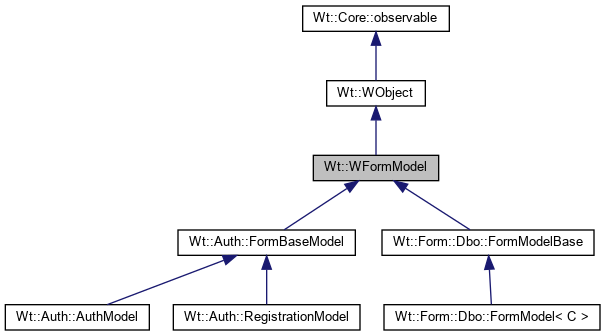 Reimplemented in Wt::Auth::RegistrationModel, and Wt::Auth::AuthModel. The field is removed from the model. The default implementation clears the value of all fields, and resets the validation state to not validated. Sets whether a field is read-only. Fields are read-write by default. Sets whether a field has been validated. A field is initially (or after reset()), not validated. Sets the validation result for a field. This will also set the field as validated. Sets whether a field is visible. Fields are visible by default. An invisible field will be ignored during validation (i.e. will be considered as valid). Returns the current overall validation state. This checks the validation() of all fields, and returns true if all all fields have been validated and are valid. The default implementation calls validateField() for each field and returns true if all fields validated. The default implementation uses the validator configured for the field to validate the field contents, or if no validator has been configured assumes that the field is valid. You will typically customize this method for more complex validation cases. Returns the result of a validation. Returns the validator for the field. Returns the field value text. This uses Wt::asString() to interpret the current value as text.